Release the key as your first task but don’t use it untill you activate once the line blaster. Use it in the last line of the screen and release the pets from their pet boxes. 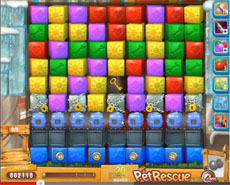 Then use the key to unlock the locked blocks. Now you have to activate the line blaster twice. Once to rescue the first group of pets, destroying the line of metal boxes and after that drive the other group of pets in the penultimate line. Then use one more time the line blaster to rescue them all, spending one move. This is the only strategy to rescue the demanded number of pets in the given number of moves.